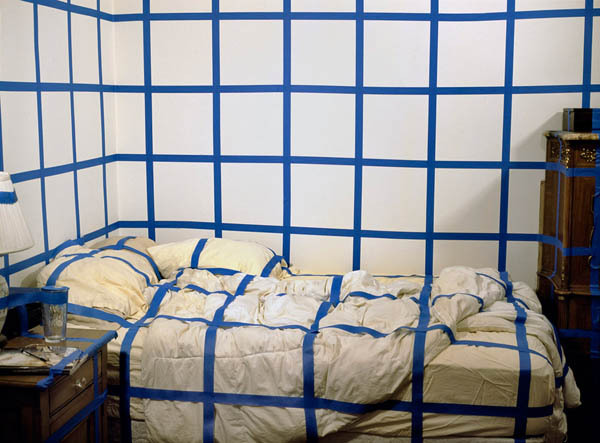 “Gridded Spaces” are site-specific installations made with painter’s tape. The tape covers the surfaces of the installation area in a grid that conforms to the dimensions of the space. The grid mimics classic perspective grids used to map out space in architectural models, paintings, drawings, etc. It follows the sight lines and planes of the four walls, floor and ceiling, and moves over any item encountered along that plane. The installation takes place in the space as it is found, i.e. nothing is moved, shifted or cleared.